Las Vegas - He may not be in Timothy Bradley Jr.'s team anymore but Cameron Dunkin will still be cheering for his former client when he fights his rematch with Manny Pacquiao. "I want him to win. Absolutely. I want him to win," Dunkin told Philboxing.com. Dunkin made known that he has no ill feelings towards Bradley Jr. and his team despite their split and that he is eager for his victory just like the time when hewas with the boxer's initial fight with Pacquiao in 2012 when he challenged for then Pacquiao's belt. Bradley Jr. will be defending his WBO welterweight title against its former owner at the MGM Grand Garden Arena and on HBO this Saturday in one of boxing's most anticipated rematch. Both parties are here in Las Vegas in the year's first boxing mega event which the boxer from Palm Springs, California co-headlines with Pacquiao. 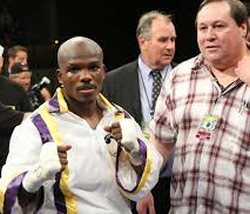 Dunkin saw Bradley Jr.'s father, Timothy Bradley Sr., last Thursday, during one of Fight Week's scheduled activities and the former manager wished them luck in their second fight with Pacquiao. "I just saw his father and he gave me a big hug. They are nice people," Dunkin said. Dunkin and Bradley Jr. parted ways this year after being together for four years, dating back in 2009. The manager was a key figure in Bradley Jr.'s recent string of big fights. His first bout with Pacquiao in 2012 on HBO was the boxer's first Pay-Per-View (PPV) main event. They also worked on another PPV card in October of last year with Juan Manuel Marquez and also last year's Fight of The Year winner with Ruslan Provodnikov last May, all on HBO and with promoter Top Rank Boxing. Bradley won all three. "We did great together. We made a lot of money together," recalled Dunkin. Bradley Jr.'s business affairs is now being handled by his wife Monica Bradley. The boxer just signed a contract extension with Top Rank Boxing early this year where she was represented by Monica Bradley during the negotiations. This rematch with Pacquiao will be the first fight as husband and wife slash boxer and manager for the couple. Photo: Bradley (L) and Cameron Dunkin (R).